I created some super flat worlds and most of the time I found the villages in these conditions. Attention! Sometimes not all the villages have this bug. As soon as you see a village, leave the game. Quickly re-join the same world and the bug should work. MC-28475 Double buildings in superflat, and half buildings on top of some buildings without nearby abandoned mineshaft: How do you upload pics on mac? MC-92751 without chest and matches villages. MC-98431 Partial generation of end cities on realms. MC-126446 Latest snapshot village house bug! 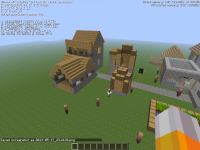 MC-127790 Fix the bug with villager garden and library house (roof spawning) (undigested). MC-140221 Houses in villages are all stacked up upon each other.